Elevate casual to an artform in the Dansko Wayne slip-on shoe. 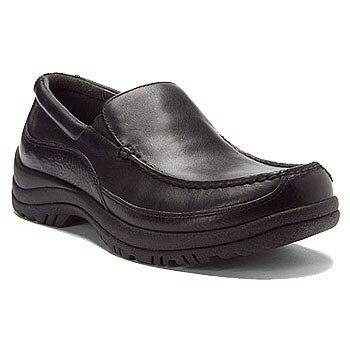 This men's loafer has a full grain leather upper with a lightly padded collar and elastic gores for easy on/off and flex. The removable EVA insole and polyurethane midsole cushion every step, while the tuckboard and riveted shank add further support. The Dansko Wayne loafer is finished with a slip-resistant Nitrol rubber sole to keep your footing secure in a range of conditions. I bought these for my husband for his birthday about a month ago, just in time for a big conference that took him out of town for work. They seemed a little clunky and heavy at first, but once he puts them on, you don't notice. WAY more support than you can ever find in a traditional dress shoe, and they still look very nice with jeans, khakis, or slacks. Great option for anyone suffering from foot pain after long days on your feet. I am a substitute teacher and stand all day. These are the most comfortable shoes I have ever worn. They are well made and more comfortable for me than a loafer. Dressy enough for a coat and tie affair, casual enough for blue jeans.